Properties in Otter Tail County average 4.7 out of 5 stars. Property 1: Beautiful cabin on pristine West Battle Lake. 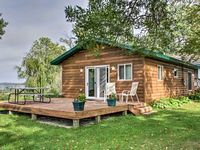 Property 4: Unwind on Beautiful Lake Ethel in Otter Tail County, MN! Make Family Memories on Crystal Lake! Property 7: Make Family Memories on Crystal Lake! Property 11: 911 Three Lakes Road...your Emergency Get Away! Property 13: Serene And Quiet Setting That Is Family Friendly. Property 15: Serene And Quiet Setting That Is Family Friendly. Property 16: Lakefront Henning Cabin w/ Fantastic Lake Views! Property 19: Serene And Quiet Setting That Is Family Friendly. Ottertail Lake at it's best! Property 20: Ottertail Lake at it's best! Property 24: Beautiful Cabin and Lake! Great for fishing and recreation . Property 25: Serene And Quiet Setting That Is Family Friendly. Property 30: Walhall Retreat - Relax, Revive, Explore! Property 50: Lake Sallie - Classic Lake Cottage with frontage on 2 lakes! Great place that&rsquo;s right on the lake! Great place with a great location with being on the lake and all the lakes around! Very nice cabin that fit 6 of us comfortably! Would highly recommend this cabin. Great price for the cabin.